Springtails were once considered to be insects, but are now known as hexapods. Springtails are extremely small. They typically measure between 1/16th and 1/18th in. long. Springtails may be brown, grey, black, white, iridescent or brightly colored. Most springtails have an elongated shape, although some are oval. Springtails do not have wings, so they cannot fly. Springtails have a furcula —a forked appendage under the abdomen held in place with a clasp-like structure known as a tenaculum — that enables them to jump up to 8 in. into the air. Springtails are most active in the afternoon or early evening. Springtails favor damp conditions and organic debris. They are often found in soil, lawns, mulch, leaf litter, compost bins and rotting wood, and underneath bark. Springtails feed on algae, fungi, decaying organic matter or pollen. If the habitat is ideal, large numbers of springtails will be present. It’s not uncommon to find 300 million per acre. Springtails die when moisture is reduced or eliminated. If it is dry outside, springtails may seek moisture indoors in bathrooms, basements or kitchens. To eliminate springtails indoors, correct moisture problems and remove wet, moldy wood. Prevent springtails from entering homes by sealing cracks and crevices under doors and around windows. Large numbers of springtails may be found floating in swimming pools, but only because they accidentally jump into the pool while seeking food. They cannot tolerate chlorinated water for long, so those in a pool will drown. Overwatered houseplants make good homes for springtails because the soil is excessively damp and the roots are decaying. Have clients check plants for springtails before bringing them indoors. Let the soil dry out and don’t overwater. Springtails can breed all year. Springtails molt even after they reach sexual maturity, much like other non-insect hexapods. 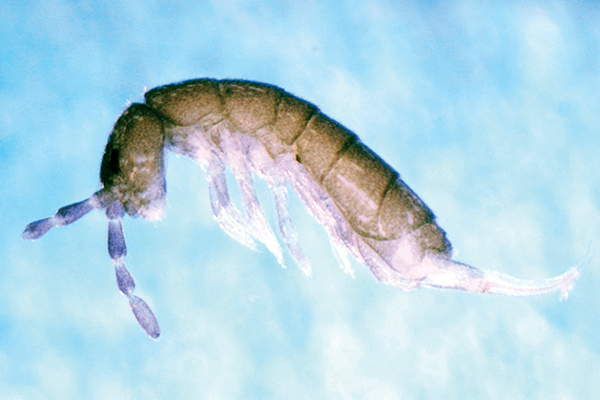 Springtails may be mistaken for fleas; however, they are smaller. They also have round, not flat, bodies that are soft. Springtails can be easily crushed, whereas fleas’ hard bodies make them difficult to kill this way. Snow fleas (Hypogastrura nivicola) are a springtail species that are active in late winter or early spring, as the ground begins to thaw. They are dark in color so they are easy to spot on snow, where they usually can be found in large numbers. - A flea, or not a flea? 2 Comments on "21 interesting facts about springtails"
Contrary to what you say, If a person has lyme disease they do infest humans. And they do spread this disease. It’s quite infectious. These animals are the first thing to decompose a dead body. Bartonella and Babesia make a person smell like they’re dead, causing the attraction. At this time, the CDC does not find research that Lyme disease is contagious to be credible: http://www.cdc.gov/lyme/faq/ —The Eds.